Aspen in the water at Puerto del Rey, Fajardo, Puerto Rico. 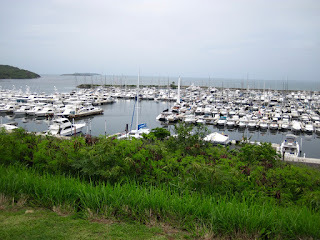 Puerto del Rey Marina, Fajardo, Puerto Rico. 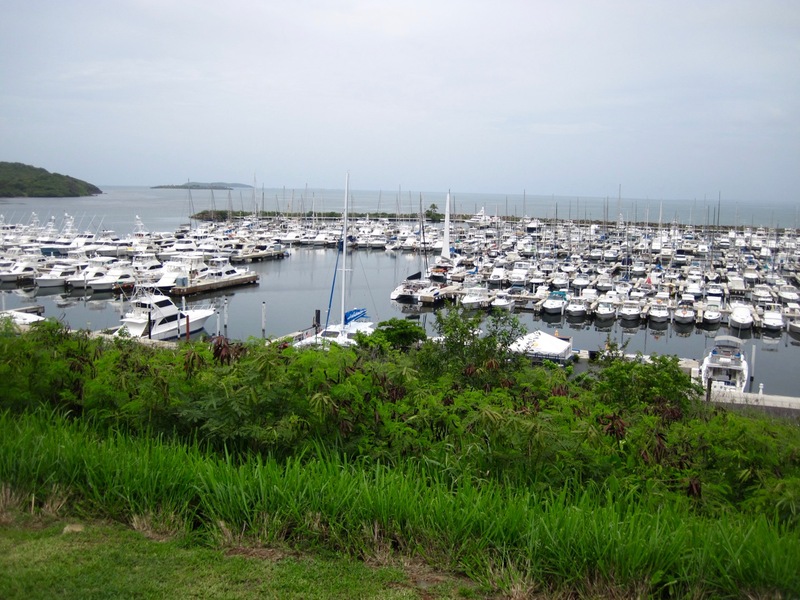 This is the largest marina in the Caribbean. Lots of boats! Aspen after getting cleaned up with new red dorades, new bimini and a shiny new wax job, courtesy of Maria. Maria admiring her new anchor - the one on the left! Admiral Maria also getting into her work. It seems all we ever see of each other is our backsides! Maria cleaning and waxing Aspen, one of her favorite jobs. El Yunque, Puerto Rico's extensive rainforest, towering above our marina. No wonder it rains so much every day! Where has the summer gone? Ah yes, we are back in the land of perpetual summer now that cold air has shrouded the high mountains in Colorado! 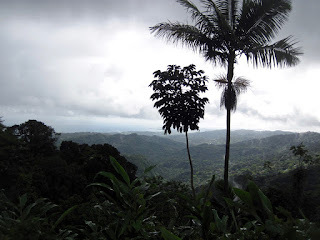 It is time for another round of not so often emails, blogs and pictures sent to our family and friends showing life in El Caribe (the Eastern Caribbean of course). Landing in San Juan, Puerto Rrrrrico the hot humid air attacked our oh-so white bodies with a vengeance. 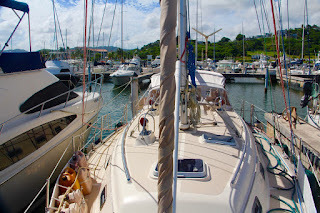 But it is the tropics and another season of sailing on Aspen lies ahead of us. 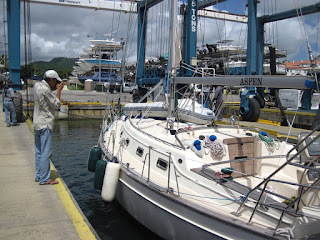 Of course we first had to get Aspen out of the dirty, messy boatyard and into the water. Maria and I anxiously watched Aspen being lowered into the sea by a huge travel lift, hoping she would float nicely so we don’t have to jump in and save her, well at least I would have to jump in since Maria doesn’t like to dive too deep. 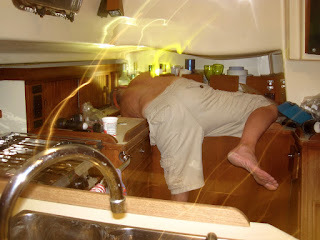 Everything went very well, UNTIL, Aspen’s engine decided not to start once she hit the water. Wow, what was that? Nothing happened when I pressed the start switch. But the batteries were fine and all systems were a go. Just the engine would not turn over at all. It is not a good place to be stuck, at the end of the slipways and in the water because the travel lift needs to drop the next boat into the water on top of us. A desperate call was made to a towing company (SeaTow) and we waited. Luckily SeaTow took their time to get to Aspen and while waiting we made one last desperate attempt and Aspen’s engine sprung to life. Fantastic! We saved $375 on a tow out of the slipways. Then the fun began. Well, kind of. Our re-commissioning list for Aspen is about four sweaty pages long, not counting buying lots of healthy groceries and rum. I keep explaining to Maria that boat work is fun but she is not buying any of it. 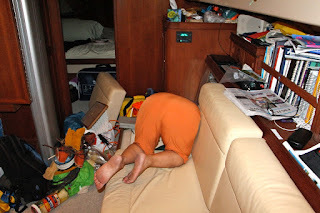 We thought we would be in Puerto del Rey Marina for 10 days before heading further east and south. South to the Virgin Islands where crystal clear turquoise water awaits, along with brilliant white sand beaches, endless hiking trails and friendly sailors anchored for happy hour. I must not be able to count the days correctly because it has been 20 days in Puerto Rico and we are still here. What is that? It seems our repair list was longer than we remembered - fix one thing and 2 other things need fixing at the same time. Hmmm, it must be a boat! Then there was the parts thing. We shipped 500 pounds of parts from home including a new anchor and chain, among other goodies and waited a LONG time for the ship to arrive in Puerto Rico. The hassle of getting our parts out of Customs was brutal, especially since my Spanish is pretty rusty and all the forms, websites and phone calls were mostly in Spanish. After two frustrating days of work, we got everything out of the bonded warehouse and loaded onto Aspen. Thanksgiving was celebrated yesterday in the marina with about 30 other sailors and we even had turkey with all the fixings with a potluck dinner at the head of the docks. drink a rum, and toast to a new season while we take another crazy trip around the sun (when the winds cooperate).